I had Tesla in the car with me when I stopped through the Starbucks drive through on Friday for an iced tea. 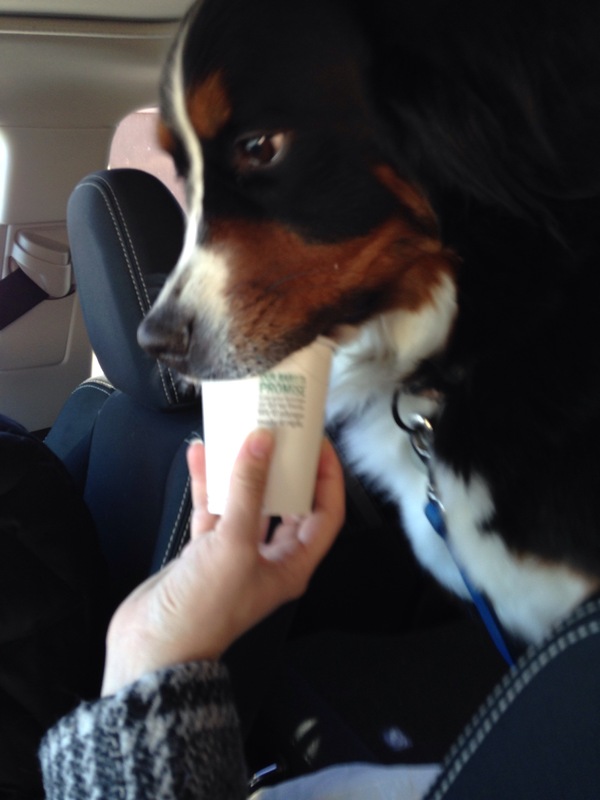 Along with my beverage they handed me a little cup of “Puppuccino” – which is just a little cup of whipped cream. And as you can see, Miss Tesla thought it was pretty great 🙂 She licked the cup clean and somehow managed not to get any on her nose (I don’t even think I could manage that). Apparently, this is an item off the Starbucks Secret Menu that you can actually order. I’ve never attempted to find the secret menu at Starbucks so I had no idea. I think I may have tried to find the Panera secret menu once, but I wasn’t that impressed. What’s your thought on secret menus? Anyone a huge fan? Any secret menu items that I really need to try out? Thanks Laurie! She really enjoyed it. I wanted to get more pics but it was over too quickly – lol. 1. Absolutely adorable picture of her. They both are actually. 2. In And Out has a good secret menu…but that doesn’t do us much good. Sbux secret menu is where I tweaked my favourite Sbux drink: Sam’s Nutella = 2 pumps mocha & caramel drizzle. Who else has secret menus? I guess that wouldn’t be an obvious answer as it defeats the point of secret. Anyone know of others?